Elymus hystrix.© 2008 Katy Chayka.www.minnesotawildflowers.info (Accessed 6/2014). Elymus hystrix is a perennial C3 grass (Basinger 2002), solitary or few stems from creeping about 80 cm. Leaves 10-30 cm long, 0.8-1.5 cm wide, tapering at both ends, rough textured or hairy. 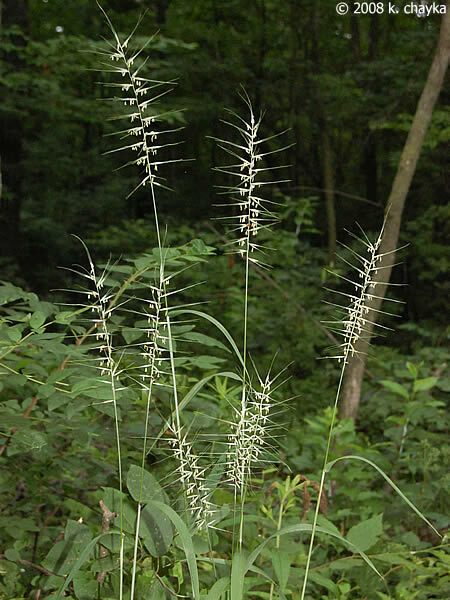 Flower spikelets well separated; awns about 3 cm, self pollinating; inflorescence spikes bristly, 5-12, cm long, erect; blooming June-Aug.
Habitat: Upland open woods, gaps. Notes: Plants often infected by endophytic fungi Acremonium sp. and Epichloë elymi (Clavicipitaceae, Ascomycota), (Clay and Leuchtmann 1989; Schardl and Leuchtmann 1999).